MK Dons threw away the chance for a first win at Leeds in their history thanks to Antony Kay's late own goal. Rob Hall put the visitors in front when he impressively finished after Nicky Maynard's ball in from the right. Maynard could have made it 2-0 but his shot was well saved by Marco Silvestri after running in from 40 yards out. But, despite Leeds having failed to get a shot on target, Kay got a clearing header all wrong in the 87th minute to send the ball past David Martin. Leeds drop a place to 13th in the Championship, while MK Dons remain 20th, two places and two points off the relegation zone. Dons had an early appeal for a penalty turned down after Hall went down in the box under a challenge from Charlie Taylor, while Leeds skipper Sol Bamba was lucky to only get a yellow card after bringing down Maynard when he was through on goal. Hall's goal came after a great piece of counter-attacking play as Maynard spotted Hall's run allowing the forward to angle a left-footed shot past Silvestri. Taylor curled a free-kick onto Martin's post before Maynard should have made the result safe as he turned well to sprint towards goal after Samir Carruthers had broken up the play in midfield, but Silvestri made an excellent save to keep Leeds in it. 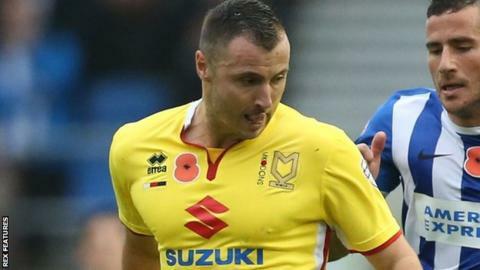 Karl Robinson's side were made to pay late on as Kay, who was back in the side after being on the bench for Monday's loss at Birmingham, inexplicably turned Taylor's cross past his own keeper to break the hearts of the MK Dons supporters. "We need to strengthen the group and we're working really hard to try and do that. "We're working hard to make that happen but we're not going to be held to ransom on wages or fees. "There's a lot of work going on behind the scenes. I had a full update (on Friday) from the president on three or four players we're really keen to bring in. He's as keen as I am." "Let's not talk about the error at the end. It's human error and we can accept that. "It's part of life, the mistakes we make as human beings. It wasn't a lack of effort or lack of desire. How can I be frustrated when they play like that? The players were excellent. "If we'd managed to win this it would have been one of my best wins as a manager." Match ends, Leeds United 1, MK Dons 1. Second Half ends, Leeds United 1, MK Dons 1. Corner, Leeds United. Conceded by Jordan Spence. Simon Church (MK Dons) wins a free kick on the left wing. Substitution, MK Dons. Joe Walsh replaces Robert Hall. Attempt missed. Charlie Taylor (Leeds United) left footed shot from outside the box is close, but misses to the left from a direct free kick. Sam Byram (Leeds United) wins a free kick in the attacking half. Own Goal by Antony Kay, MK Dons. Leeds United 1, MK Dons 1. Corner, Leeds United. Conceded by Antony Kay. Attempt blocked. Sam Byram (Leeds United) right footed shot from a difficult angle on the right is blocked. Offside, MK Dons. Robert Hall tries a through ball, but Simon Church is caught offside. Offside, Leeds United. Lewie Coyle tries a through ball, but Mirco Antenucci is caught offside. Mirco Antenucci (Leeds United) wins a free kick on the right wing. Lewie Coyle (Leeds United) wins a free kick in the defensive half. Corner, MK Dons. Conceded by Lewis Cook. Substitution, Leeds United. Lewie Coyle replaces Stuart Dallas. Corner, MK Dons. Conceded by Marco Silvestri. Attempt saved. Nicky Maynard (MK Dons) right footed shot from the centre of the box is saved in the bottom left corner. Assisted by Samir Carruthers. Attempt missed. Robert Hall (MK Dons) left footed shot from outside the box is high and wide to the left. Assisted by Jordan Spence with a headed pass. Nicky Maynard (MK Dons) wins a free kick in the defensive half. Lewis Cook (Leeds United) wins a free kick in the attacking half. Robert Hall (MK Dons) is shown the yellow card for a bad foul. Mirco Antenucci (Leeds United) wins a free kick in the defensive half. Attempt blocked. Josh Murphy (MK Dons) right footed shot from outside the box is blocked. Assisted by Dean Bowditch. Sam Byram (Leeds United) is shown the yellow card for a bad foul. Foul by Sam Byram (Leeds United).